Intel is a name that you usually hear if you are a computer user. Most of the laptops, computers and other notebooks run on Intel processors. Intel is very keen in developing these processors like anything. Last year they have come with Skylake processors with many innovations. 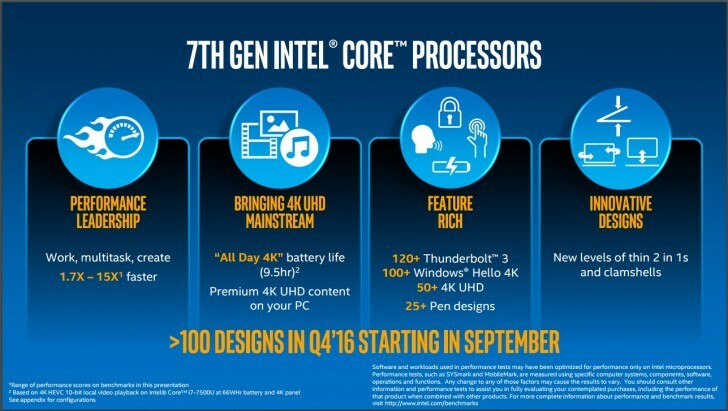 Now they have unveiled Kaby Lake processors their 7th Generation Processors. Compared with Skylake series, Kaby Lake series also holds certain unique features which I would like to mention below. The latest Intel Core processors will be available in 6 various specs. 3 of them is having 4.5W TDP classified under Kaby Lake Y-series. These are targeted on tablets and 2-in-1 ultrabooks. They are facilitated with Dual Core processors supported by HD 615GPU.The other 3 will be known as Kaby Lake U-series and they are facilitated with 15W. These processors are meant for notebooks and high-end laptops. They are also Dual-Core processor but supports 620GPU. These features ensure that 7th Gen Kaby Lake processors are 70% faster than Skylake Processors and also 3.5x faster in 3D graphics performance. Kaby Lake processors are having Intel’s 14nm or 14nm+ architecture. This making helps in enhanced Fin Profile, Improved Transistor Channel Strain and Compact Designing and Manufacture. This helps in improving the performance of Kaby Lake processors by 12% in processing and 19% in web surfing. Laptop users may not find this a great deal. But when the processor is having support for 4K media consumption, 4K encoding and decoding support, it’s a great deal for notebooks and 2-in-1 ultrabooks. With this 4K media support these devices can run high end videos without having the support of extra graphics. The new processor is inclusive of HVEC 10-bit and VP9 decoding facility to support 4K Ultra HD content. With these features Intel confirms that their 7th Generation Processors are 15% swifter in playing 4K videos. Like the previous Skylake processors, Kaby Lake processors also prefer Thunderbolt 3 USB. They are enhanced with 40Gbps bandwidth, Power Output of 100W and 60Hz 4K monitor support. The new processor also supports 3rd Generation PCIe support with faster data transfer upto 8GT/s when compared to 5GT/s as in PCIe 2nd Geneartion. With the Kaby Lake processors, you can enhance your battery back-up upto 15%. It is promised by Intel that 4K UHD HEVC 10-bit video streaming is supported up to 9.5 hours and YouTube videos-VP9 is backed up to 7 hours.